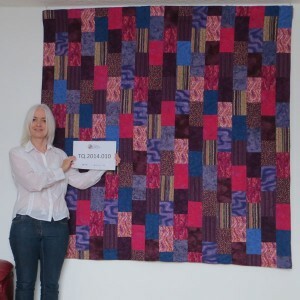 In this interview Jenifer talks about her first quilt, made in 2011 to help her severely disabled son Jonathan make a smooth transition from a residential school to an adult placement. 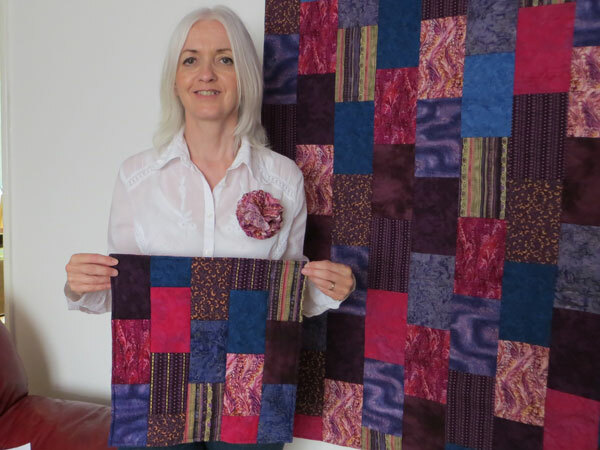 Given Jonathan’s complex needs (being profoundly deaf, having no vocal communication and being on the autistic spectrum) Jenifer devised a thoughtful solution involving the making of a simple quilt with matching pennants to represent significant people and places. They discuss Jonathan, the transition process and Jenifer’s experience of working with professional care providers. They move on to consider wider issues, including the value of craft skills , creativity and the therapeutic power of quilts and craft groups in society. Dorothy Baird [DB]: My name is Dorothy Baird and I am in the home of Jenifer Nathan in East Yorkshire. Today is Tuesday 24th June 2014 and the time now is 11.15 in the morning. Jenifer, a few years ago, uh, you contacted me to say a friend thought The Guild might be interested in the story of your quilt. DB: Well we’ve finally caught up with you and the quilt is here behind us, so just to start, can you give me an idea of, where you got the idea, the concept for, for the significance of this quilt, the way of using this quilt, the way you did, for your son? JN: Right, OK, do you want me to say something about Jonathan? DB: Yeah, that would be lovely. JN: My second son, Jonathan, uh was born severely brain-damaged and he is profoundly deaf and he has absolutely no vocal communication and he is on the autistic spectrum. And he had been in a residential school for a number of years and this was going to end at nineteen. So during his transition phase which began when he was about fifteen, there was always an eye to the future of where he would end up because he would have to go into an adult placement at nineteen. 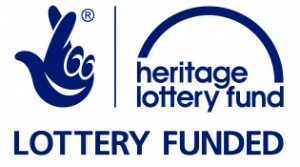 So, we sorted all that out, we found a suitable place, we got the funding from the authority and then it was just a matter of, introducing Jonathan to the new placement. But, because he had no hearing, because he is non-verbal, because of his autism, his understanding of sign language is extremely limited, he had about three signs at the most and they were all food related, so his communication difficulties are extreme. Now in the past we had used, a method of communication called ‘objects of reference’. This is quite logical, this is quite straightforward. We do it every day. So, for example, if you were to pick up your car keys, people would naturally assume that you were going out to drive your car because the keys are the objects of reference that’s what you are using to refer to the activity that’s the associated object. Similarly if somebody picking up an umbrella you’d assume it was raining. So they took this, years ago they had used objects of reference to mean, and we would give each person involved with him an object of reference and it could be anything, it didn’t have to be anything associated with that person. I think one of his teachers of the hearing impaired had a big wooden fish that she wore round her neck, so we were able to show him this in the morning and he would know that she were coming. Now I think I’d started get, getting an interest in quilting and then it dawned on me, somehow it just popped into my head, objects of reference, something tactile, something he could hold, something that he could, he could not avoid looking at. Oh I’ll do him a quilt, it’ll double up as something for his new bedroom, but I can use that as a way of showing him that he’s going somewhere else, because this process was going to take many months to do. You can’t, you can’t really just pick them up and then take someone on overnight and say this is your new home because they have had a long time in one place and it’s very distressing. So it’s a way of sort of, you do it gradually to ease this person, to reduce the fear and to prepare them properly. So, so I set to work really and then. I found a book, it was a designer called Amy Butler and I don’t know how I found her, I think I was probably just messing around on the internet and I thought ‘oo, I like her stuff’ [DB short laugh] and on her website it said ‘free downloads’ so I thought, ‘oo, I wonder what they are’, and she had a pattern, a quilt pattern on there, ‘Brick Path Quilt’ and so I downloaded it and I had a look through it and I’d never made a quilt before and, as you do, I looked through the instructions and I thought ‘oo that looks quite straightforward’. [DB short laugh] and so I thought ‘I like that’, and in the meantime I’d purchased her book and it featured in her book but I didn’t really notice it in her book because she’d used such pastelly colours. So anyway I thought, I’m going to have a go at that, that looks good and I really didn’t know anything about quilting at all, and we had a shop in the city, because I live in Hull, and it’s gone now unfortunately, but it was the only shop I knew that sold fabric. So I went in there and with a view to finding these fabrics and I saw one on a bolt and I thought [clicks fingers] that’s the one, I like that one and that’s what they call, I believe, I later found out it’s what they call an inspiration fabric and that was the start of the choice of all the others. And, I think I needed, I think it was eighteen colours, I’m not sure, so I built the rest of the colour choice around them and I somehow always drift towards purple, [DB short laugh]. I never do anything in yellow really and everything always ends up in purple, I don’t know, maybe it’s just, child of the 70s I don’t know [DB short laugh] but, I just love beautiful, vibrant colours and I knew it had to be vibrant for Jonathan not to be able to ignore it and not to drift into the background. So, I just built gradually, I spent quite a while buying these fabrics because, and I had to go to other places as well, and bless them, they’re great in quilt shops aren’t they because you’re going in and you’re thinking ‘ooh, which one?’ And I did literally spend hours and I love, I love picking out fabrics, I love being around them and I kind of go into my own world a bit when I’m doing it. So eventually I got all the fabrics together and then I started cutting them out. I don’t think I’d ever used a rotary cutter before and I’d bought all the equipment and the ladies in the shop, that was it, I’d done one workshop in that shop and I’d made an open box, and so I thought if nothing else it will get me used to cutting things out and I hadn’t realised how hard I’d have to press [DB short laugh] and I did all of them in one day, oh, and that was the other thing, ‘cos I was researching everything, I thought ‘oo, to wash or not to wash?’ And I came to the conclusion that I’d better wash, so I’d washed them all and I’d let them dry naturally and I think I did starch on them and I was trying to do it all properly and then I started cutting them all out, oh, my arm was killing me at the end of the day but I got it all done. Are you all right if I carry on, yeah? [DB: Absolutely, yes] And then, really because this was a brick path quilt, this was, and so they were fairly straightforward shapes. But the hardest thing I think is, when you are trying to create a random effect there is an awful lot of work and thinking into creating a random effect. That’s where your bed comes in handy, because I’ve got a really small place so I started laying out these, bricks on the bed and I was very boring and right in the middle I started with oh and that’s it I’m a bit OCD this way, I, one of the things I absolutely love about quilting is, you can sort things out into categories so each, each colour was in a bag and with the number of the colour and, the number I managed to cut out, so [pause] I’m a bit methodical that way, so I laid out the first row just going from one to eighteen, then it was a matter of arranging all the others around and it took a long time because I didn’t want repeats and I was trying to make it look like it had all just fallen on the bed and then of course on this downloaded pattern, she’d had a layout, so I dutifully filled in all the numbers, I loved doing all that bit. And then it was a matter of sewing all those strips together. Which I did. And then I got the batting. DB: Did Jonathan see it incidentally at this stage? JN: No, no, Jonathan hadn’t seen a thing. And I don’t think anybody other than my husband and my youngest son knew anything about this, not at all. Because I wasn’t sure, I’d never done it before and I thought that I might make a mess of it and then I might have to think of something else. And one of those things when you’re quilting and working on something like this, it’s a very good opportunity for your mind to tick over and you start thinking of other things you can do with it because you’re then thinking well it’s all very well making him a quilt, because he would be travelling two hundred and about two hundred and thirty miles from his previous placement to his new placement, ‘how am I going to show him, when he gets in that car, where he’s going?’ So as you are making all this I was thinking ‘oh I could make a mini version of this’, I think it was about 12 by 12 inches and we could give him that as he’s leaving the current placement and he sits with it in the car and then we take him upstairs immediately to where the quilt will be and Jonathan although he gives the impression that he doesn’t notice things he’s very visually aware. He kind of sees what he wants to see and I mean, for example, he could see a biscuit from five miles away, but if you’re trying to get him to do some work with you he acts as if he can’t see and in fact at one time he was known as functioning deaf blind. So I thought ‘ah I could make a small pennant out of this for him to go in the car’. So I’m busily merrily working on the quilt and then other ideas start coming in, because Jonathan is very [brief pause] selective about who he lets into his life, who he gives eye contact to. And when you think of it from his point of view, ‘cos he would have been about 18 at this time. Over these 18 years he will have seen probably hundreds of professionals, yeah teachers, occupational therapists, speech and language therapists, teachers of the hearing impaired, there would have been hundreds and they all change over the years and then he had a new placement, when he went into the last one, so there was a whole new group of people. And I think in order to protect himself he has to tune out a lot of things in his life because if he gave everything the same level of significance he’d constantly think ‘well, where are they now?’ or ‘who’s that’? and it does gradually dawn on him, he does realise when somebody is in his life on a daily day-to-day basis they develop a significance for him. And I used to run a developmental program on him for two years and I had forty volunteers coming in and out of the house and we did things like patterning and various other developmental exercises on him and if he ever met those people again, even years down the line you could see him going through his interior filing system and pulling out the card ‘ah, that’s you!’ and he does remember people, he does remember faces. DB: So how did you, what did you use to kind of identify the key people at this stage? JN: Well the important thing was, to try and get him to understand that there would be a whole new group of people coming into his life, but there would also be people who were already in his life who would be staying in his life. People like his dad, myself and his brothers. So, as I was making the quilt, I, I started thinking, as usual, and I thought ‘well, they could all wear a different colour from the quilt’ and it started off initially as a ‘well I’ll just give them a bit of fabric to pin on themselves that has come from the quilt’ and these, these people would be doing lots of visits with him over that year and he would be making visits to them, but initially the people from the new placement would be coming down to him and I didn’t want them to fade into the background. I wanted him to realise there was something significant and something that linked them all and so we had, we had a meeting and I’d completed the quilt by then. And it was at the new placement and I thought right, this is, I’m going to roll out my idea to them. And came, and they were absolutely delighted and we put the quilt on the bed and then I said ‘oo I think it would be a good idea for you to all to select a colour, each individual have a colour, there’s eighteen colours so there’s plenty to choose from, I’ll make you a swatch or something for you to wear’. I’d already made the little pennants by then. I said these can go in the car and in the past on my very first quilting workshop I’d made a little open box square, it was like what the lady had taught me that day to introduce me to quilting. I’d managed to make two of them that day and I’d already sent one down to Jonathan because he loved optical illusion type things so he already had that one and so we were already going, I’d told them that we were going to use the other one as a way of showing him that he was going to be returning to his old placement. So, and I thought what will they think about this because I’d been at home well by that time nearly twenty years. I’ve not done paid work outside the home and I’m not a professional and you’re with people who have got degrees, training and years of experience. And you kind of know your place, if you know what I mean, sometimes and I thought they might go for it they might not, but they were really, really receptive and what was even better was that the social worker from the adult team who had to oversee everything was really receptive and so I didn’t have to persuade them and they were all very keen and eager to ‘oh I can’t wait to get my swatch’ and ‘which colour are you having?’ and I mean one of them, she was [DB: It must have been a real revelation to them really] yeah she was a real girly girl and she had the shocking pink one and so yeah I didn’t have to worry about that and in fact his social worker said ‘well I wish every parent was as proactive as this’. And I remember thinking at the time that out of all those people in that room I had the fewest qualifications, no professional qualifications but I was the one that came up with the idea. Actually nobody else had said anything. Nobody else had suggested anything. And I think that the irony is, is that when Jonathan went away we had to put him in residential I’d always done crafts, I’d not done quilts, never heard of it, but I’d done a lot of cross stitch in the past and I don’t do that anymore. And I’d done knitting and I’d always made my own clothes and things like that and made stuff for the boys. And in the year before he was due to go away, I uh, I remember thinking ‘what do I want to bother with all that for?’ ‘What good is that to anyone? It’s ridiculous. What use is this? How is that ever going to help anyone?’ And I packed everything up and except for a bag of knitting needles, I kept those, and I kept the sewing machine, the old sewing machine that my mum had given me, and I took the rest up to the North West where my dad is. And his, my step-mum she’s big in the Mothers’ Union up there and she likes crafts. So I said Barbara do you think anyone at church would want any of this stuff and can I get rid of it on you. I mean there was a floor-standing frame and to hold the frame and all that and my dad said ‘oh you should have seen them when that thing arrived, they were like a plague of locusts’ you know they came over [DB laughs] so everything had gone by the time Jonathan left and I never touched a thing to do with crafts for years until he did his transition. Now I’d kept all my craft books and I had this book by a man called Stuart Merrett an Australian guy and it was called Appliqué Art and in the introduction he explains how he got into appliqué. And he’d been living in Britain for a number of years and his daughter died very suddenly and very tragically and he was absolutely understandably overwhelmed with grief. And he travelled back to Australia and he literally buried himself in doing something creative and he became very good at appliqué, I mean he’s done things I think like Sydney Races and massive walls, wall hangings and murals and absolutely beautiful work. I remember when I read this and I thought how can anyone get out, come back from the life when using this, it’s ridiculous and of course I’d got rid of everything, this wasn’t going to help me. 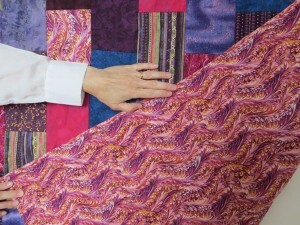 And so the idea of the quilt was as an aid for Jonathan but it became a therapeutic tool for me [long pause]. And [long pause] and also, it has become a way of me remaining a part of his life. JN: Well, the other thing. JN: I felt, as well when at this meeting at the end of it and Jonathan’s dad is a professor of electronic engineering and he has a very high tech life and I feel a bit left behind by life sometimes, I’m a bit old fashioned and I think there’s a danger these days of, uh an undervaluing, a de-valuing of traditional skills and I, I get quite cross about that because I think they have just as much significance, just as much importance in people’s lives, and in fact I, I would go as far as to say that they are more necessary in many ways than other things because I think as human beings we need a creative outlet. It is a way of taking time off from our lives. Another thing that used to happen I think in days past is that, and you’ve probably experienced this as well, when you go to a quilting group you are not just talking about your quilts, you’re talking about your children, your marriages, your relationships, your illnesses, the problems in your lives, the struggles, the challenges. Now in this day and age in order to replicate that, we have devised something called group therapy, where a group of strangers go into a room and are expected to spill their guts about everything going wrong in their life and to expect this to be a very trusting and safe environment while being overseen by someone who is recording everything and looking out for stuff that might get, might be troublesome. Whereas I think something like a quilting bee or a workshop or just a sewing group you go to, a knitting group, anything, a man in his shed with his mates, these are organic processes and these healing, healing processes arise naturally, they’re not contrived, they’re not forced. And I think that’s why they are so important and why we mustn’t lose them, and why, in a way, I was so delighted that this old fashioned idea, this old fashioned craft had been incorporated into a very professional and high-tech world and worked. I mean this is a very, if you like, low-tech solution to a very complex problem. I think it was Terry Leahy who used to be CEO of Tesco who said the problem is that people often confuse simple with simplistic and they believe that in this very complex world we have to have a complex solution for things and I think nothing can be further from the truth, often we need a very simple answer to things and it’s great that perhaps people are, I think it’s wonderful this revival in crafts because perhaps people are beginning to see that there’s more to life than, than just a much more sophisticated lifestyle with ever increasing and encroaching technology. And I think it also helps us to perhaps, at the moment we don’t seem to have the level of discernment about the use of technology in our lives and whereas this sort of holds us up a bit and says ‘you know what, you know, maybe we should look further back, or whatever and see if we can find an answer’ and it’s just wonderful that something so traditional and so old, it has, has been shown to have relevance. JN: Well, everybody co-operated [DB: put this into practice] yeah, yeah everyone cooperated and bless him I chose him a colour for my husband. He wasn’t really bothered but I made sure it was on the blue spectrum. [DB short laugh] and my ex-husband sorry, Jonathan’s dad and he wore it every single time his jacket and tie and his floppy. I’d made them into flowers actually and I’d bought some big ‘happy birthday’ badges from ASDA and stuck them on and everybody co-operated and it was really good and we did have, I think, a very smooth transition and rather interestingly I thought, well which colour shall I chose and I chose the background because I think often with mum’s we are often in the background but we are always there and in fact Jonathan is very much a daddy’s boy and always was because dad always gave in to him and, well you know what it’s like, mums have to be the disciplinarians sometimes. And in fact I had to arrange to be in the car park during the first visit so he didn’t think ‘oo no’ you know ‘I’m with her today and where’s dad?’ so we, and Alan was brilliant, so he, his presence all the time on all the visits and we didn’t really have a problem. But Jonathan always has to make a slight protest so he went on a shaving strike for the first few months and he had a massive beard for a long time, and he did go on a bit of a food strike, but the rest of it has been fine. Yeah, and I think it worked really, really well for someone with his level of communication needs. Yeah. DB: And do you still use the rosettes and pennants now? DB: So he naturally moved on? JN: Yeah, I think it was really the only thing we could have done the only way, something visual, something tactile whatever that is, I think because of my interest it just happened to be a quilt but it worked and of course a quilt says, you know, this is your, where you’re sleeping. DB: Mm it says so many things does a quilt. JN: Yes it communicates such a lot to him, yeah. DB: Do you think the professionals in his life learned from this this exercise, from what you did? JN: I think they did [short pause] but I don’t [pause] the problem is professionals come and go and a lot of the people that work with Jonathan are quite young and they are using it as a stepping stone to somewhere else so they might get their NVQ3 and then they’ll apply for a job elsewhere. But many, he’s the only person in his placement who is deaf and has no speech, so really the other people don’t have those problems. But I would hope that if they were to have a person with the kind of communication problems that Jonathan has, they would think about using objects of reference. And the other thing we use of course, there’s a system of communication for people like Jonathan called PECS, which is ‘Picture Exchange Communication System’ and, uh they, you know, the person will give you a little tile, if you like a picture, of the thing that they want so you exchange things and I used to do this with food, so Jonathan would come home and he’d ‘I want bread’ he’d sign ‘bread’ and I would cut a slice of bread up into four bits and then give him the PEC that said ‘bread’ you know had a picture of bread on and then make him do the exchange and he would have to do that four times I would try and eek out the number of times. And I made PECs for the quilts, the pennants because they would have a timetable and the PECs could be stuck with Velcro on the weekly timetable so he would know that on this day ‘there’s the brick path quilt PEC that means I’m going to be there’ and then while he was there his weekly timetable at the new place would, say, have two brick path quilt PECs so he knew he was only there for like and they would take one off as he passed through the day and then the next one would be an open box quilt meaning ‘you are going back to the other place that day’ so it was another visual way of doing, yeah. DB: So he knew where he was, when it was happening. JN: Whether it was permanent, or so and that reduces anxiety for him. JN: You know, which was the aim of the game, the aim of the game was to make this as easy for him as we could and as I said in my, ‘cos I wrote all this in a report and I had it comb bound and I gave it to everybody and said this is what we’re planning on doing, this is what I think will work but it will only work if we all do it, we’re all consistent and we all liaise with each other and we’re all doing the same thing and bless them they did, they did. DB: You make a reference to this report which actually we have with us [short laugh]. An incredibly erudite piece of work. JN: Yeah, not that bad for a mum! DB: Looking at everything from home, family relationships, who’s involved, where they are, what the processes are, it’s an incredible piece of work. But there was something I read in your conclusions that I, you know, that I found not only very moving but is amazingly significant, and again something you are talking about that simple view [JN: yeah] a simple perspective of individuality we tend to lose that somewhere along the line and I’d be really grateful if you could go just through those points that you had written in that report. JN: Yeah, ok. However while all input is relevant every case needs to be dealt with on an individual basis as all people are different. This hypothesis holds true regardless of whatever part of the community an individual belongs to. No two non-disabled people are the same, no two black people are the same, no two Muslim people are the same, no two Jewish people are the same, no two people with mental health problems are the same, no two people without mental health problems are the same, no two people who display sporting prowess are the same. Similarly no two people who have learning disabilities, autistic spectrum disorder and sensory impairment are the same. DB: Thank you [pause] and quilts are things to do with comfort, they are not only to do with colour and design and what we get as quilters from it, they’re given as gifts, they’re given with love, they’re made with love and this, this whole project you’ve devised is absolutely remarkable and as an act to a son from a mum that makes such a profound difference to his life and easing his transition from one stage to the next I think is absolutely admirable, I think it is wonderful. JN: And I think it’s, it’s things like this are going to be my legacy and I think when you go somewhere like the Quilt Museum and I went when they did a Red Cross Quilts and the people in Canada had made quilts for the bombed out people in Britain and you think of all the rich people and all the fantastic cars you have and what survived, you know, what survived of these people? No-one will ever remember them probably for anything else but that they cared enough about people, somebody, a complete stranger or a relative that they made this thing. And it’s an expression of care and it’s an expression of love. It’s an expression of how important people are to us. And I’m not sure I know of any other way a physical thing rather than, eh you know, an abstract thing like love or consideration or anything but yet there are very few possessions we can have in life or make that, that retain their significance and what they meant and the qualities of the creator. Sorry. DB: What are you doing now? JN: Well, now we are on to Jonathan’s other quilt [laugh, DB: Ahh!] because when I found the quilt on the wardrobe and said well ‘do you mind if I have it back?’ We brought it back and they redecorated his room. I think that was why they didn’t use it actually that it didn’t go [DB short laugh] with their colour scheme [both laugh]. And Jonathan has a big problem with red, he can’t cope with red, my youngest son loves red so if Jonathan comes back here and there are red things in his room he won’t stay in his room. So they redecorated it in sort of aquas and greens and stuff I went in and I said ‘oh have you got a spare bit of the wallpaper and I took it home and that’s that one there. So you can just see the back of it. DB: Oh, work in progress. JN: Work in progress. It it’s turned into a bit of a monster [laugh, DB: lovely] and whereas with the brick path quilt, the quilting was very, it was stitch in the ditch around each tile and, my word, I didn’t realise how many knots I’d have to do [DB laughs] and it took, that was the bit that took the longest was, you know, finishing off and starting again. And with his new one I want to really have a good go at free-motion on that, that’s another reason to do it and it will go but it’s funny the people at the home say ‘oh is the quilt ready yet?’ and I think people, well, it is rather typical of today isn’t it, you know, people think oh you just knock them up like that. And it’s taken, it takes a while to get the colours together, to choose them, to cut things out to sew them together and then you say well you know I’ve got to quilt it all, and but yes, definitely it’s a work in progress. And I think the other good thing about these kinds of projects is that perhaps some of the people working with Jonathan ought to try them is they slow you down a bit slow down [DB: yes, stop the world] Yeah [DB: I want to get off]. Have a look around you and don’t just keep rushing through. DB: Do you, do you make things for yourself? DB: You make things for Jonathan obviously [JN: yeah] do you do things just out of flights of fancy. JN: Oh yeah, absolutely. I mean I just I make things, oh that’ll be nice I’ll try that or I’ll think that’s a good way of learning x so, you know like especially Christmas, I made some nice erm cushion covers with the birds on them. It was like fuzzy cut stuff and everybody seems to like the colours I choose. Somebody said to me once ‘oh, you’re very brave with the colours that you choose.’ And I thought well why do you need to be brave? You know, it’s a quilt, you’re not going to die if you get it wrong. But eh yeah, I’ve got a lot of UFOs at the moment [DB: don’t we all] but haven’t we all [DB: don’t we all]. DB: We were talking just a bit earlier this morning about travel, that because you had your friend staying with you [JH: oh yeah] as part of this what is it? JN: Women Welcoming Women World Wide [DB: that’s right] or five W International Friendship Organisation. DB: Right, right, so obviously your friend had travelled from Australia and was continuing to travel. Have you travelled? JN: I used to live in Germany for a while [DB: I see] and I uh, no I haven’t travelled. DB: I wondered if you were a quilting traveller because people do go off to America and here there and everywhere for quilting purposes. How about you? JN: No, I’d like to go I think because I’d like to, it’s so much more widespread over there whereas here you do, you do have to travel actually in Britain a lot of the time to find somewhere. And I do buy things online but I don’t tend to buy a lot of fabric online because I like to be able to touch it [DB: yes] and see it and see and you don’t always get a good representation of the colour online [DB: no]. So I do, wherever I am I do tend to find a somewhere to go and I have a look around quilt wise. Yeah. DB: Do you belong to a group at all? JN: No, I’ve been to sewing groups but I’m a bit of a lone wolf I think. 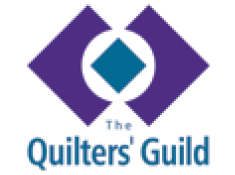 DB: How about quilt shows? Would you travel to a quilt show? JN: Yeah, in fact when I was in Bristol earlier in the year, the friend I was staying with, I said ‘oo, can we go to Cheltenham and see Goose Chase Quilting?’ and it’s eh run by Sarah Wellfair and while I was there she was saying that the Malvern Quilting Show was on but it was a bit short notice for me to go, but I’d like to go to that, but the Twisted Thread one I understand is very, very busy. DB: Is this Birmingham Festival of Quilts? JN: The Birmingham, yeah so I understand that’s quite crowded but yeah I would go, the problem is my youngest son who is also deaf and has special needs, as well, I seem to spend an awful lot of my time devising things for him. One thing actually I think about children with learning disabilities and children with special needs generally, it forces you really to think of ways of doing things that aren’t necessarily that straightforward. I mean how do I teach Jonathan to use his thumb and forefinger together? Well you would never have to do that if you had a child without special needs. Or if you did it you probably would just tell them ‘oh no just pick it up with your thumb and forefinger’. And I remember I bought some gloves and I chopped off the forefinger and the thumb so Jonathan could only use those two. And so having him in a way I think has made me a much more creative person. And a much more adventurous person with creativity. I’m not frightened to try things. DB: You certainly think outside the box, don’t you? JN: Definitely. But I owe that to him really and a lot of what I’m doing with George, the youngest one, you know, I’ve been able to be more innovative in ways of getting him and of supporting him, because I’ve had this experience with Jonathan. And obviously, the older boy, he saw me doing things over the years, so it’s made him a much more innovative thinker and that’s Jonathan’s legacy really. That is Jonathan’s legacy which I’m, I am very grateful for but I would have been quite happy not to have it if Jonathan had been OK, yeah. DB: Of course. So in quilting terms looking into the future if you could have a wish list of things to do, places to go, projects to start, what do you see yourself looking for? JN: What I’d really like to do is, I’d like to start a quilting group in my area [DB: ah ha] I’d like to get it more out there. The area I live is known as an area of deep social depravation and [pause] we have like a youth project and things like that and I think that there’s a lot of lonely people out there and a lot of people who feel very, very isolated and we do have some great facilities here, great buildings and I’ve, I’ve approached them and they’ve said ‘oh you know, could eh, how much it would you charge us for this room and’. But then it’s always a matter of insurance, you know, people bring their own machines and stuff like that and I’ve no doubt that from my own personal energy point of view it would be great, I could get it going, but then I think I wonder if I did my City and Guilds I’d perhaps have a bit more kudos, I’d you know maybe they would be more willing to let me do this, … but I’d really like to get it out there. I’d like to get it into a different demographic if you don’t mind you know. I do tend to find it’s mainly older people, I mean I’m fifty so I’m not exactly a spring chicken but it does tend to be older professional women who do it and I would love to make it more democratic if you like and have an inclusive, raise its profile, increase its popularity and then I think there would be a lot more fabric shops which could only be for the good! [DB laughing] yeah I think that would be great! I really, that’s what I want to do. I want people to rediscover this kind of thing because I think it has a lot of relevance in modern days and a lot of healing properties and I think we could, we could serve a lot of social problems with this. I mean I would like to have a group where someone could come who’d never done it before and uh they could use, because I sewed Jonathan’s quilt on my old sewing machine, I didn’t even have a ¼” foot, somebody said ‘oh that’s roughly a ¼ and I was too ignorant to know anything about this and so you can turn up with an old machine and you can start making things. You don’t have this huge outlay and you get going, get cracking and get talking, get chatting to each other. Discover your neighbours, discover what’s on the doorstep, knit yourselves together. This is what community, this is what life should be like and I think it’s achievable. JN: Maybe I should put Jonathan’s quilt up in our local Healthcare Centre which has other rooms and say, to show people this has relevance to you, you can do this too. I mean, I did this with no experience and I did it and I managed it and I’m no, no great seamstress. So you can sew in a straight line [short laugh, DB: who needs a straight line when you’ve got to learn curves] I’ve got to learn curves now! I’ve got to really go off the beaten track. DB: Well I really wish you well with that that’s a wonderful ambition and I’m right behind you because I totally agree [JN mm] with what you are saying about people coming together, being supportive through simple channels, simple opportunities to chat. JN: We have a patient support group at our GP Practice [DB: yes] and I think I might suggest a local [DB: yes] craft group to them [DB: yes] but I think there’s an awful lot of people with depression or other things, just lonely people who could get a lot out of it [DB: yeah, well you know] without medication. DB: The research that says quilting and well-being go hand in hand. JH: Oh I’ll have to get find that and present it to my GP. DB: Absolutely. Well good luck with that. DB: And thank you very, very much indeed. JN: And thanks for your interest in talking to us. DB: I know lots of people will really enjoy and get an awful lot of inspiration from this interview, your interview, I certainly have. Thank you.